IJIIRD available online to the reader without financial, legal, or technical barriers. IJIIRD ensure that the articles publish by author meet the standards of discipline. 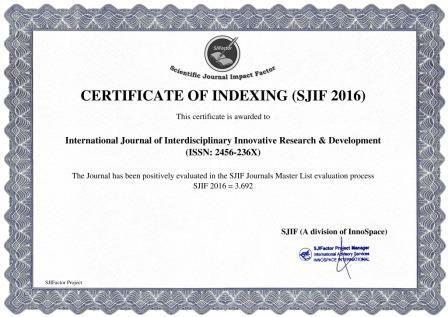 IJIIRD, is a English Language Journal of knowledge domain fields published in Asian country, is a global forum for scientists and engineers altogether aspects of disciplines of Applied Science , Engineering Technologies & Management to publish prime quality and refereed papers. The papers for publication in IJIIRD are elect through rigorous peer reviews to confirm originality, timeliness, relevance, and readability, where as it emphasizes the publication of decadently unpublished materials, elect conference papers with exceptional benefit that need wider exposure square measure, at the discretion of the editors, additionally published provided they meet the journal’s referee commonplace. Journal publications are a vital part of academic career advancement. All the published papers are submitted to the major indexing services for indexing. 💡Fast and efficient publication process. 💡High visibility through different platforms.